There's more than one artist/show with this name. (1) Rally was a Swedish humor radio show, aired on Sveriges Radio P3. The show consisted of comic remixes of various famous songs, some dialogues and such. Frequently occurring episodes were, among others, various parodies of the gaming show "Bingolotto", "Gundeman & Pekka" which is a parody of Swedish skiing champion Gunde Svan and a Finnish-Swedish friend of his, "Doggy Bag" - a parody of rappers (Swedish in perticular), Stefan Livh was the show host, but lots of people were involved. 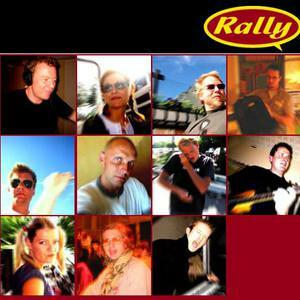 (1) Rally was a Swedish humor radio show, aired on Sveriges Radio P3. The show consisted of comic remixes of various famous songs, some dialogues and such. Stefan Livh was the show host, but lots of people were involved. Rally was cancelled in late 2004 simply because all good things must come to an end, gathered again in early 2005 to do a "best of"-show, and has since not been heard from. (2) Rally is a newly formed Japanese rock band from Japan. It features members and former members from 3 of the country's biggest rock bands: GLAY, THEE MICHELLE GUN ELEPHANT and The Mad Capsule Markets. So far they have only recorded and released one song (a cover of BUCK-TICK's song "???" to a tribute album "PARADE ~RESPECTIVE TRACKS OF BUCK-TICK~" that was released in 2005). The exact aim and future of the band is unclear. Formed in a damp walled cellar under a disused flower mill in Carluke, South Lanarkshire. Four degenerates regresed into the power trio that became RALLY. A string of sucessive hits from the debut album "A Long Way To Go" seen them rise high on the alternative MP3.COM charts with several back to back number 1's and a string of top 10 hits for the latter part of the '90s. Almost 10 years later, through the miracles of modern technology,RALLY have reformed into a killer 4 piece band. Stay tuned for the overly awaited and soon to be released second, and aptly titled album "From The Ashes".